JMU's Virginia Repertory Dance Company will join the Shenandoah Contemporary Dance Theatre in a Dance Showcase, Friday, April 5 at 6:00 pm. Please join us at Dance & Company for this collaboration performance! Due to inclement weather, Dance & Co. will be closed on Tuesday, January 29, 2019. Please see our inclement weather policy for more details. Thank you! 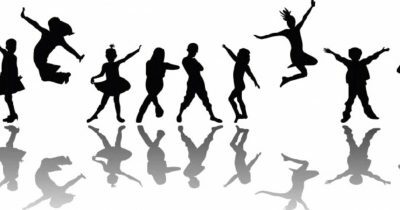 Friday, January 18, 5-6:30 pm - Kids ages 5-11 are invited to join the SCDT for an evening of dance activities and fun! Only $5 to participate! Proceeds benefit the SCDT. Don’t miss this classic story put into dance by Ballet students at Dance & Company! Due to snow, the performances have been moved from Jan. 13 to Friday, January 18 at 7:30 pm. Please join us for this Ballet rendition of a heart-warming story! Please join the Shenandoah Contemporary Dance Theatre as they perform at First Night Harrisonburg! Performances will be December 31 at 6:00 and 7:30 pm at Dance & Company studio - 115 South Main Street. The SCDT will premier several new dances at this time. Hot cocoa and t-shirts will be sold. Don’t miss it! First Night buttons required for admittance. See http://firstnightharrisonburg.com/ for more information. Due to inclement weather, Dance & Co. will be closed on Thursday, November 15, 2018. Please see our inclement weather policy for more details. Thank you! Drop in at the studio on September 7, between 7 pm and 9 pm, to meet the dance teachers, register for classes, and enjoy a treat! We hope to see you there! Join us for our 2017 Spring Concerts at JMU's Wilson Hall on Saturday, May 27th at 7pm and Sunday, May 28th at 3pm. The concerts are FREE, open to the public, and will feature dances of all levels and styles. 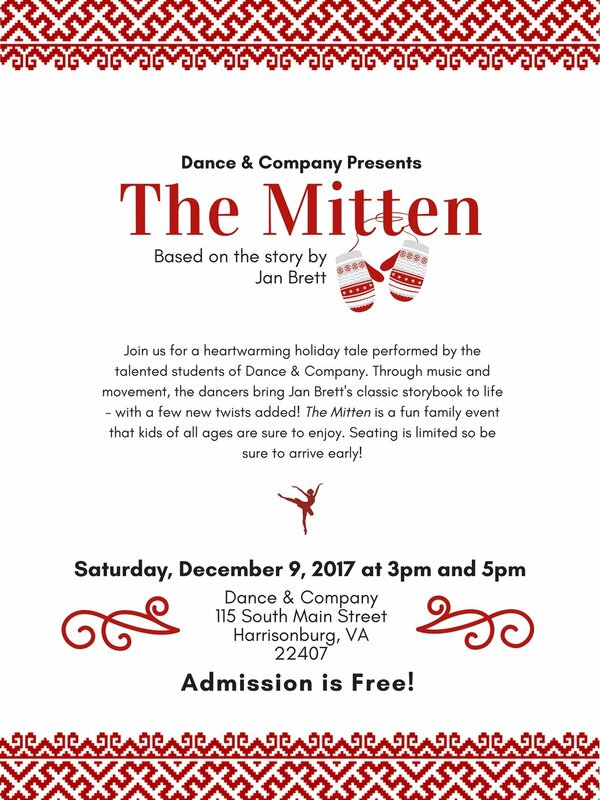 The Shenandoah Contemporary Dance Theatre Jr. and Sr. Companies will perform and many "stories" will be told through each dance. We hope you can come! Join us for these FREE concerts Saturday, May 28th at 7 pm and Sunday, May 29th at 3 pm at JMU's Wilson Hall Auditorium! Featuring many dance styles and levels as well as Senior solos and pieces by the Shenandoah Contemporary Dance Theatre. Shenandoah Contemporary Dance Theater Auditions will be held Friday, September 25, 4:45-6:15. Interested dancers should come prepared to dance and dressed appropriately, including tights, leotard, hair back, and no gum. All ages may audition. Ages 11-18 will be considered for Junior and Senior SCDT companies. Support CORA School of Dance! Dance Concerts were held at JMU's Wilson Hall on May 23 at 7pm and May 24 at 3pm. Don’t miss this extraordinary opportunity to develop your appreciation for the art of dance and work with one of the best! Intensive is open to any dancer studying at Int. –Adv. Levels, ages 11 and up. Qualifying students are strongly encouraged to participate. Students will be instructed in technical skills, challenged to respond to original ideas and introduced to fresh material. Workshop culminates in the creation of a new, original dance which will be performed at First Night in Harrisonburg and also rehearsed intermittently on selected Friday afternoons next semester in order to be performed in the Spring concert. Cost of additional rehearsals is included in tuition. Holiday intensives provide dancers the opportunity to advance abilities while visiting and having fun with dance friends. Won’t you join us this Holiday?! November 7, 2014 7:30 p.m.
All students in Drew's classes, note: I will be holding all of my classes which I teach personally, next week at regular days and times. I cannot speak for other faculty who may have made previous plans for travel during the scheduled break. "Foul weather" as stated in our policies, is dealt with by having the student attend an alternate class of similar composition offered by the dance center. Because of excessive closings due to bad weather conditions, many of our dance faculty will be scheduling class make-ups during this week in order to catch-up on class curriculum goals and concert choreography. This is optional, at the discretion of the instructor and varies class by class. Not all classes have suffered a cancellation. Unless your teacher(s) have notified students in writing, by email or hand delivered note, that she/he will be holding class next week, assume classes will not be held during the week of March 22-29. Be on the look out for possible notifications from teachers regarding individual class make-ups. COSTUME PRICE LISTS ARE ATTACHED TO THIS EMAIL. Costume payments are now due! I am required to PRE-PAY for ALL costumes and have done so by placing charges on my own personal credit cards. Your immediate payment saves me HUGE finance fees on these charges by allowing me to pay the bills as they come due. Thank you for your prompt attention! !